Parker Hannifin Corporations Electronic Controls Division har lansert sin Pro Display 10 ISOBUS, et app-basert human-machine interface (HMI) som inkluderer Parkers nye ISOBUS Suite-program. Systemet er konstruert for kjÃ¸retÃ¸y og maskiner innen skog og landbruk, som traktorer, hogstmaskiner og andre selvgÃ¥ende maskiner. Tradisjonelt vil hver landbruksmaskin og redskapskombinasjon være utstyrt med en individuell terminal basert på produktenes proprietære løsning. I dag, takket være ISO 11783, kan en enkelt terminal brukes til å betjene forskjellige maskiner eller redskaper som tilfredsstiller ISOBUS -funksjonene som en individuell applikasjon I Pro Display, som også kan brukes som kjøretøyets hoved HMI-skjerm. Totale kostnader og plassbehov reduseres da det ikke er behov for en separate ISOBUS-terminal i kabinen. Å bare ha en HMI-skjem i maskinen kombinerer praktisk maskinfunksjonalitet, diagnostikk, et effektivitets måleverktøy med infotainment og underholdning i en sentralisert og kostnadseffektiv løsning. Parkers ISOBUS Suite er en applikasjonHaving just one HMI display in the machine cabin conveniently combines machine functionality, diagnostics, efficiency tools, and even infotainment and entertainment, in a centralised and cost-effective solution. Parker’s ISOBUS Suite is an application for ISOBUS functions that includes ISOBUS UT, a user interface for ISOBUS-compatible implementations. Also included is a file server for the ISOBUS network to facilitate easy data transfer, and a task controller, which means the display is able to perform accurate variable-rate control and documentation of actual data values. A major benefit of the new product is its fully integrated design. The apps-based system ensures that all essential HMI functions for instrumentation, controls and adjustment can be integrated into a central HMI display. Further benefits of integration include reduced operating complexity and risk of errors, which in turn improve efficiency and ergonomics for users. Parker provides its proven UX Toolkit programming tool for Pro Display, which allows the quick and easy development of apps. The easy scalability and adaptation of ISOBUS Suite are valuable features of the software. Such flexibility allows two different control systems to be shown simultaneously on the screen, for example. What’s more, if required, the dynamic Parker ISOBUS Suite can be easily integrated with other applications from the OEM customer. 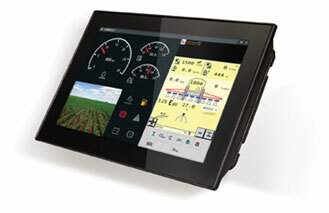 Pro Display 10 ISOBUS uses a powerful dual core processor and 1 GB RAM to facilitate excellent performance levels. The unit features a high-level 10.1inch LCD display optimised for the demanding HMI needs and challenging environments in which it is required to operate. The use of In-Plane Switching (IPS) technology results in clear images with great colour reproduction and wide viewing angles. A touchscreen interface enables intuitive, rapid and accurate interaction for the user, although the platform can also be controlled using remote buttons or a pulse wheel. Pro Display 10 ISOBUS supports a wide variety of communication interfaces, including four CAN interfaces that support communication up to 1 Mbps and enable simpler installation with software-controlled termination. Further interfaces include USB, RS232, Ethernet and wireless (Bluetooth and WLAN), while infotainment features such as audio, FM radio and camera interfaces are also incorporated.